Crashmapper.org a web-based app, developed by CHEKPEDS was launched in New York City, on February 28, 2018. The application received very positive reviews from Streetsblog “ This Is the Tool You Need to Push for Safer Streets in Your Part of NYC”. A reputed transportation consultant calls it ” a fantastic tool” and even some DOT employees find it “cool”. 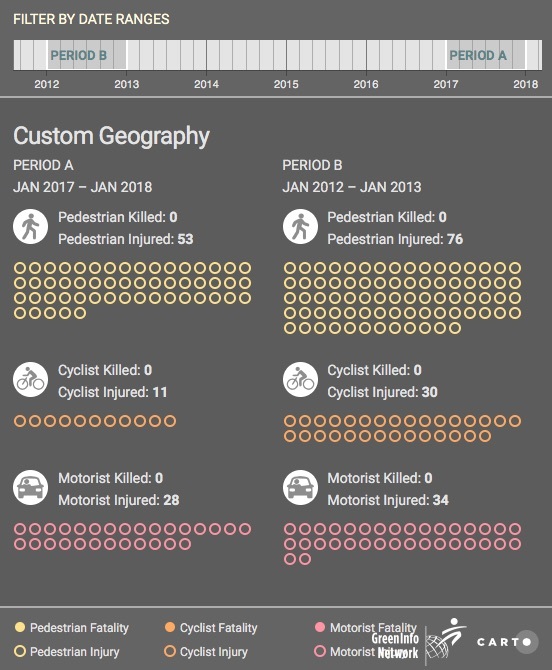 Crashmapper showing crashes on 9th avenue in 2017. 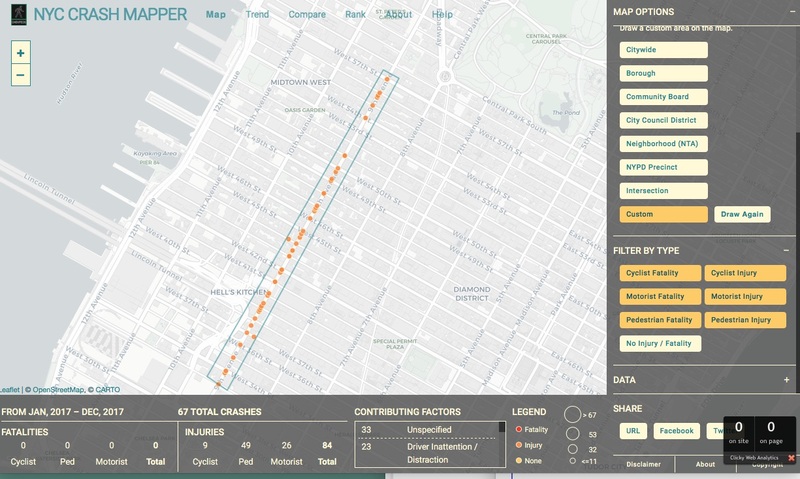 Crashmapper.org, a new web-based app that maps and analyzes traffic crashes and trends in New York City will be launched by CHEKPEDS, a non-profit coalition for pedestrian safety, today. The app has data from 2012 and incorporates updates from New York City open data portals. Although traffic fatalities are on a downward trend, there were still over 60,000 injuries and deaths in 2017 in New York City from vehicles. To accelerate increased pedestrian safety progress, it is critical to fix intersections that contribute disproportionately to this epidemic. Each passing day means injuries or deaths that could be avoided and families saved from the agony of losing a loved one. Using New York City open data in real time, the application maps, trends, compares and ranks intersections and streets where crashes have occurred. With a few clicks, crashmapper.org makes available to all—activists, press, elected officials, agencies, police precincts, community boards, and business improvement districts—the information necessary to evaluate in minutes instead of days the safety of our streets, and request remedies accordingly. The app also allows the user to define custom areas to evaluate the effectiveness of a given street improvement. “Location data has the potential to change the way we see our environment, and the plans we make to improve it,” said Tyler Bird of CARTO, which is supporting the project with a grant for its services. “Our grant program is designed to make these tools available to more organizations looking to make smarter, data-based decisions, and Crashmapper is a shining example of how Location Intelligence can be utilized in an engaging and meaningful way to create safer communities for citizens. This entry was posted in CHEKPEDS, pedestrian, Traffic Justice and tagged crashes, pedestrian, safety. Bookmark the permalink.